Road markings have a very significant role to play in conveying crucial information to road users, and are also useful at communicating requirements which upright road signs may fail to. While a verge-mounted sign can sometimes get obscured or blocked from normal viewing, road marks and lining works on the road can relay a continuing message to the rider or the driver and, as such, they play a vital role in averting accidents on the roads and in safeguarding thousands of lives. Additionally, road markings and lining works help in defining the path or route to be followed through hazards, separate any conflicting movements, and also help in delineating the road edges on an unlit road at night. These markings also go a long way in regulating traffic and improving junction capacity by encouraging lane discipline. Lines, symbols and, sometimes, even words painted on urban roads and junctions help to control, guide and promote road safety. White and yellow line markings are made along pavement edges and in between roads to bring out a harmonious flow of traffic and supplement messages conveyed by road signs or signals. These lines may be solid, broken, single or double, and each line conveys different meaning to drivers. Yellow lane lines, for example, normally act as a divider that separates lines of traffic moving in opposite directions, while white lines separate traffic moving in the same direction. Solid white lines also denote that passing is allowed but with caution. 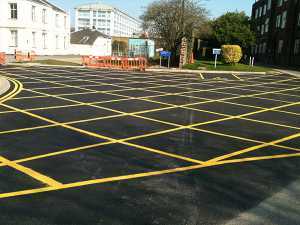 While the main function of linings is to regulate traffic, they also serve to distinguish different zones such as parking and non-parking zones. 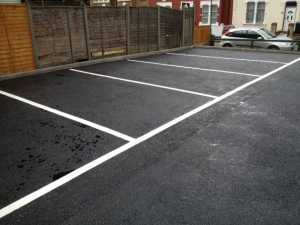 Car park markings make way for a more organised parking system. Linings are not just restricted to the roadways; line works also play a significant role in averting accidents in warehouses and factories. Factory floor marking facilitates a safe working environment where accidents can be minimised. A variety of numbers and letters, arrows, pallet lanes, line works, and walkways in accordance to health and safety regulations can be incorporated in factory alleys to improve business efficiency. While it may sound easy to just draw a line or arrow to regulate traffic and car parks, it is easier said than done; there are a number of regulations that need to be followed. Thickness of lines, broken or solid – if varied – can change the very meaning the line is meant to convey. It is important that all road marks, lining work in factories, or car parks in your business are in accordance to the legal regulations prescribed by the secretary of state of transport in England and by the department of regional development in Northern Ireland. Road markers that guide traffic need to be illuminated by a retro-reflecting material. In addition to this, any road studs used must comply with the European standards BS EN 1463. 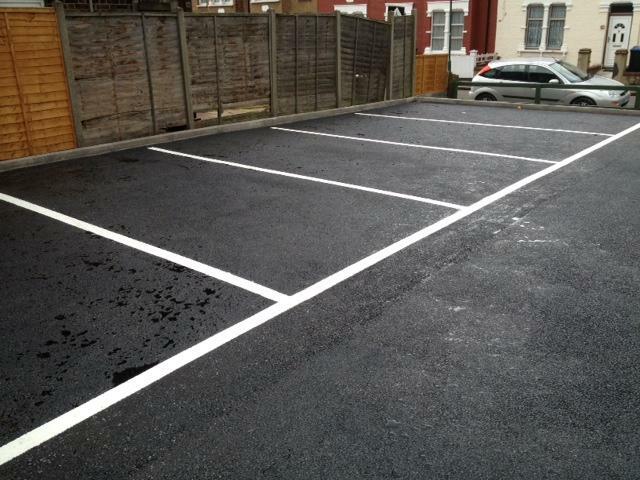 With a number of regulations that need to be in place, it is of paramount importance that one should hire a professional lining work company, for they will know the exact legal obligations for laying road markings and line works. Not only will a professional company know the laws, but it will also guarantee accuracy, quality and durability, which in turn paves way for a safer working environment in a factory or warehouse, or for even laying out car park delineation at your business premises. A professional lining and surfacing company – like the experts at UK Surfacing – will have years of experience, skilled workers, know-how, and the latest technology and machinery to their names, which will make the complicated process of surfacing and lining work, a breeze. So for more information on road marking and lining work services, get in touch with the specialists at UK Surfacings today!